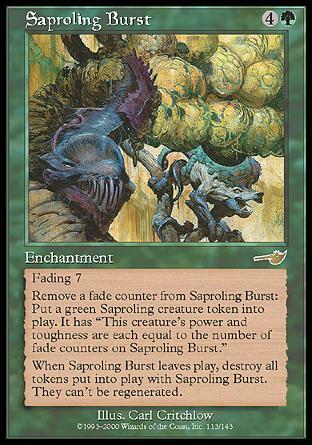 Remove a fade counter from Saproling Burst: Put a green Saproling creature token onto the battlefield. It has "This creature's power and toughness are each equal to the number of fade counters on Saproling Burst." When Saproling Burst leaves the battlefield, destroy all tokens put onto the battlefield with Saproling Burst. They can't be regenerated. Quand l'Explosion de saprobiontes quitte le champ de bataille, détruisez tous les jetons mis sur le champ de bataille avec l'Explosion de saprobiontes. Ils ne peuvent être régénérés.